I have a problem, and it’s serious. Well, it’s serious if someone tries calling me on my home phone. The problem is that I have one of those cordless models, and I either can’t find the handset, or I don’t get it back on the base unit to recharge. So, when my phone rings, I can’t find the phone, or it isn’t charged….you get my drift. Most people who want to talk to me end up calling my cell phone. I decided a while back to fix this problem by getting a snazzy new desk phone. I wanted something that would be more than just another charger base siting on my desk, but would be useful and nice looking, too. I had seriously thought about getting a refurbished old phone – it would have the kitschy cool style I like, but I would have to give up the features I wanted – namely a cordless handset. I searched for a few weeks before I found my perfect phone – the Vtech LS6195 Phone. It was love at first sight! The vtech phones are retro styled (but would look good in a modern environment, too), with all of the modern conveniences we have come to take for granted. It looks like an old style phone with a connected handset, but the portable handset has its own speakerphone and number pad. You can dial from the pushbutton rotary styled numbers on the base, too. The new vtech phones have call waiting and caller ID! When you add in the built-in answering machine, it’s almost more than a girl could ask for! One feature I really like – when the handset is in in the cradle on the base and the phone rings, it answers when I pick up the handset – just like a real phone! It also is substantial, meaning it has a little weight to it. So many of the desk phones these days are just a gloried handset with a base made out of flimsy plastic. This phone should last for a while, and I don’t think I will lose it. 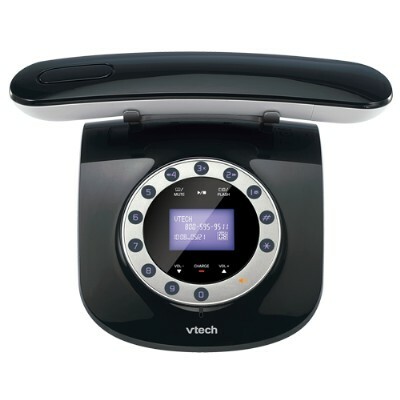 Connect with VTech Phone on twitter and facebook, too. Originally published on 2012-07-17 by Greta Brinkley at Greta's Day .